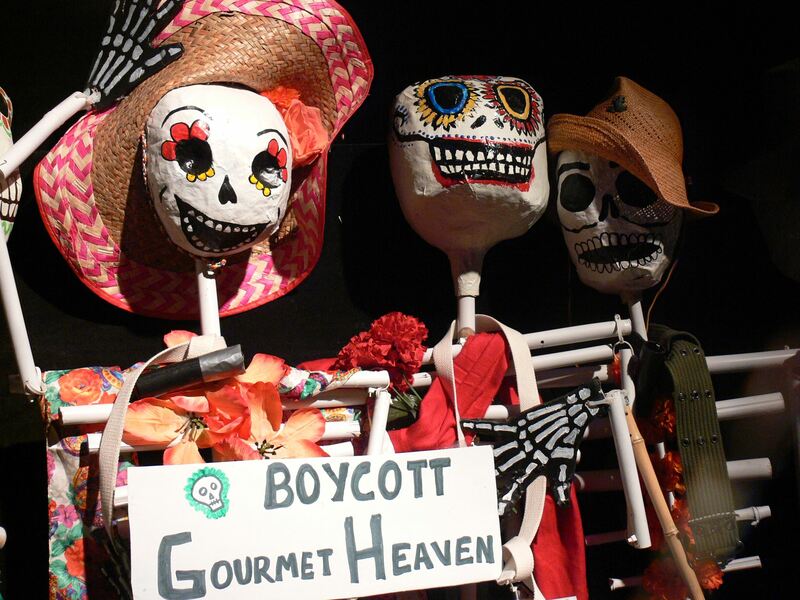 Please support our friends at Unidad Latina en Acción in their efforts to stop wage theft at Gourmet Heaven – sign the petition, and join our weekly picket line, 5:30PM Fridays in front of the store at 15 Broadway, New Haven. Contact: John Lugo (203) 606-3484, New Haven Workers Association / Unidad Latina en Accion; Evelyn Nunez (312) 613-9204, Yale College. From ULA: “While students took a break from protesting Gourmet Heaven to celebrate the holiday with their families, the deli on Yale property fired four workers in retaliation for their Department of Labor complaint. The four men, Misael, Isai, Cristian and Julio worked 7 am to 7 pm, 6 days per week, earning $4.16 to $6.25 per hour for three to eight years. In July 2013, Misael’s brother filed a complaint with the DOL claiming that he was owed nearly $10,000 in unpaid minimum wage and overtime for eleven months of work. The DOL shut down the deli on August 7 and re-opened it when the owner Chung Cho agreed to turn over accounting books to the government. Emboldened by the community support, eleven workers, including Misael, Isai, Cristian and Julio, met with the DOL on November 26, 2013 and testified that they had earned between $4.16 and $6.25 per hour for many years. The DOL stated that they had reached a settlement with the owner Chung Cho that he would eventually pay $140,000 divided among 25 workers — only a fraction of what the workers were owed — plus $10,200 in fines to the DOL. The workers informed the DOL that Mr. Cho was continuing to pay overtime hours in cash without paying the required time and a half. Soon after the meeting, the manager began pulling aside the workers one by one, stating that the owner was aware of the meeting, and that “snitchers” would be punished. Weekly protests will continue until justice prevails. Follow the links below for recent news coverage.